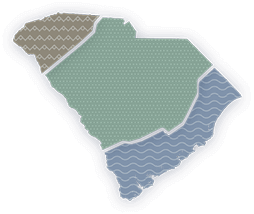 Get to know the 2019 South Carolina Chef Ambassadors and learn about the unique culinary opportunities you can experience and enjoy in the Palmetto State. From how they got started in the business to where you can go to enjoy their dishes, find out everything you need to know about these five South Carolina Chef Ambassadors. Chef Marc Collins understands the importance of staying creative and keeping things fresh. This serves him well as he continuously strives to be original with both his food presentation and recipe development. This AAA Four-Diamond, Mobil Four-Star restaurant offers traditional Southern cuisine with a modern twist in a sophisticated, historic setting. Chef Brandon Carter first realized his love for the kitchen on a family trip to Italy when he was 13 years old. Since then, he's let his passion for food continue to develop and grow over the years. The culinary team at FARM strives to create an experience that everyone can appreciate and enjoy. With a focus on locally sourced produce, everything on the menu is fresh and delicious. Chef Jessica Shillato of Columbia, South Carolina aims to show off real, homemade Southern food, farmers and artisans through her business. She makes fresh cuisine with an inventive twist. Spotted Salamander, located in Columbia, specializes in inventive Southern cuisine and uses only the freshest ingredients. Chef Tania Harris has a passion for creating unique, mouthwatering dishes and continues to draw inspiration as she observes the world around her. Lazy Goat is located in Greenville, South Carolina and offers visitors a unique dining experience. This Mediterranean-themed restaurant offers something to suit every palate. Chef Kelly Vogelheim resides in Florence, South Carolina and is Executive Chef of Town Hall Restaurant and Bar. Her passion for food began at an early age, and she continues to create inspiring dishes. Town Hall is farm-driven and Southern-inspired. With a constantly evolving menu, this Florence restaurant keeps things interesting.